Reuters has reported that Nancy Pelosi, Speaker of the U.S. House of Representatives has “ramped up” her criticism of insurance companies. The immoral and villianous nature of insurance companies has not, however prevented Pelosi from accepting campaign contributions from them. Johathan Allen of CQ Politics notes that "Pelosi, of course, has accepted campaign contributions from said villains this year and in the past, as have most of her Democratic colleagues. Pelosi's campaign committee, for example, took $2,500 from AFLAC's political action committee on April 13. But she's not giving the money back just because she thinks the sources are immoral and villainous. "'As the Speaker's opposition to the health insurance companies being in charge of American's health care shows, there is no link between political contributions and positions on policy,' said her spokesman Brendan Daly." Thus far, reporters in Connecticut, once referred to as the “insurance capital of the world,” have not asked members of Connecticut’s U.S. Congressional delegation, all Democrats like Pelosi, whether they believe such home grown insurance companies as Aetna and the Hartford are immoral villains. Perhaps Senators Chris Dodd and Joe Lieberman or U.S. Reps Larson, DeLauro, Himes and Courtney would consider offering Pelosi and the insurance villain of her choice a beer at one of their houses. Connecticut’s state income tax is Lowell Weicker’s baby pretty much in the same sense that, say, Fords are Henry Ford’s baby. He’s the guy who twisted knuckles and toes to get the thing past. Weicker now wishes to disassociated himself from the inevitable and logical consequences of the tax, and to this end he has given an interview to Ted Mann of the Day of New London in which he claims that the current deficit of $9 billion, give or take a billion, is the result of human nature and not a foreseeable consequence of his tax. Who knew, after all, way back in early 1990, that the tax designed to discharge a deficit of a little more than a billion in a $7.5 billion budget would metastasize, leaving the state, only two governors after Weicker gave birth to it, with a budget more than twice as large and a debt more than three time as large? In a rare humorous moment from Weicker, the father of the state’s income tax claimed that his lieutenant governor, Eunice Groark, mothered the state’s multi-billion dollar levy. But we know who the daddy really was, and so does Weicker. His DNA is all over the tax. When Weicker brought in as his Office of Budget and Management chief William Cibes, who ran for governor on a pro-income tax platform and was thumped, Republicans smelled the rotten mackerel wafting in the wind. Tom D’Amore, Weicker’s chief aide who popped up recently as an advisor to Ned Lamont’s campaign against Weicker’s bete noir, Sen. Joe Lieberman, served in the Meskill administration. It was during this time that D’Amore became comfortable with an income tax. The Meskill administration gave birth to an income tax that was snuffed out by an alert legislature hours after it been conceived. Weicker’s interview with Mann is, in a sense, the former governor’s attempt to own up to the realities of present day life in Connecticut without accepting any responsibility for the ruinous results of his “courageous” decision to brave contumely – and apparently beer bottles – when he went ahead and did his courageous thing. This mock courage was brilliantly skewered by Chris Powell, the Managing Editor of the Journal Inquirer and its chief columnist, in a recent opinion piece. Weicker, a nominal Republican, always has maintained a foot and a half in the Democratic camp, mostly for reasons of self preservation, and he has consistently used the Republican Party as a foil to promote his own career, terminated when Weicker saddled the state with an income tax. Nothing in the Mann interview, most of which has remained on the cutting room floor, will surprise seasoned Weicker watchers. The man in full is there, if only in flashes: the bluster (Powell once reviewed Weicker’s adulatory autobiography “Maverick” in an extended opinion piece titled “Mr. Bluster Saves The World"); the revisionist review of recent history (Gagging on the metastasized bottom line of successive state budgets, Weicker, the Atlas of Connecticut politics in the view of his few remaining admirers in the state, now shrugs that human nature is responsible for the outcome, a present budget deficit that dwarfs the deficit Weicker used as a ploy to convince querulous legislators to support his and D’Amore’s and Cibes’ income tax); the shear audacity of pretension. Take, just by way of example, Weicker’s notion that budgets exploded after the income tax because human nature is what it is and he was incapable of changing human nature. Human nature has not changed radically in the space of three governors. Democratic legislators were acquisitive before the income tax and they were more acquisitive after it -- because the tax provided them with more money jingling in their coffers. The bare and hearty truth is that the income tax was designed by Weicker and Cibes and D’Amore to spare them and the Democratic Party the trouble of making economies through spending cuts and prudent outlays of money. And it succeeded in its object beyond the wildest dreams of the tax eaters in state government. The income tax, in other words, was the gas thrown on the fires of irresponsible state spending that Weicker protested in his campaign for governor as a reason not to impose an income tax on the state he would soon leave for greener pasture after his work of destruction had been accomplished. So here we are, two decades after Weicker’s “courageous” decision to impose a new revenue stream on his state. That stream leads directly from people and businesses to state coffers and eats out the substance of the people. Weicker apparently is moving back to Connecticut at a time when wiser heads will be moving out. Democrats have just proposed to increase taxes by $1.5 billion; the state debt is $9 billion; nuisance taxes are being raised; UConn has projected that the state is in for another prolonged slow or no growth period such as accompanied Weicker’s courageous decision to impose an income tax on Connecticut. Most of this has been manfully but ineffectively protested by Weicker’s cast off party. And Weicker’s solution to the mess he is chiefly responsible for causing is – to start a new political party. Like the one that gave us the income tax? What we really need is a Jeffersonian revolt against puff toad politicians. The words “tax increase" were still dew on the lips of Gov. Jodi Rell when Don Williams, president pro tem of Connecticut’s Democratic dominated legislature, began to twist the knife in her ribs. Said Williams, the development “could mark a watershed moment in the budget crisis that has gripped Connecticut for more than a year. Fiscal reality has finally caught up with Gov. Rell — the same fiscal reality she should have dealt with in January, not July." "For six months Gov. Rell has led the legislature and the public on a wild goose chase — ignoring deficit projections and avoiding the toughest decisions. It is unfortunate that it took the consensus revenue forecasting law to get the governor to finally address fiscal reality." A "watershed" moment for Williams is one that allows him to continue to stroke and pet his favored constituencies without having to make "hard" budget cutting decisions. Connecticut has seen this mating dance between cutters and spenders ever since the sun rose on an income tax that has tripled in the course of three governors. One of them, Lowell Weicker, has just finished lamenting to a reporter that the fallen nature of mankind is responsible for the tripling. Democrats, reaching for the last jar of peanut butter in a nearly empty pantry – a progressive tax on the diminishing rich – call for tax increase to meet ever growing budget needs. A need, conservative columnist George Will reminds us, is a want that is more than 12 hours old. The Republican governor protests. There follows a set-to in the newspapers. Everyone’s hackles are got up. The media calls for “pragmatic” solutions, a little tax increase here, a little spending nip there. Decisions on budgets are absurdly prolonged. The fiscal year ends without a final decision of the budget. The two camps theatrically shake their fists at each other across the ideological divide. They huddle together at the state capitol’s former smoke filled rooms or in the governor’s residence. Suddenly, there is light; a rapprochement is arrived at. A gesture is made towards budget cutting. Taxes are increased. The chairs on the Titanic are shifted around. Everyone is very pleased with everyone. Kumbaya is sung. The curtain is rung down. Editorials are written praising all for their sagacity. This year the Democratic Party has decided to cut spending by eliminating the name of the Department of Motor Vehicles; no jobs will be lost. The governor and leading legislative Democrats, after months of fist shaking, have agreed to tax increases. Having gone as far as she could in applying her dictum – no tax increases before every effort is made to cut spending – Rell has succumbed to Democratic blandishments and the two warring parties are moving towards a “compromise.” With a Democratic majority in the legislature poised to override her vetoes, how could the governor do otherwise? Really, the lady is quite helpless. Initially Democrats wanted an obscene and destructive 30% increase in corporation taxes; after caucusing, Democrats reduced the rate to 15% over the next three years. Rell has offered 10% to be paid by companies for three years from 2009 through 2011. Quite apart from the destructive impact corporation taxes have on competitive corporations, no company has ever paid a corporation tax from their profits; corporations collect taxes at the point of sale and pass on the tax to consumers. Sin taxes on liquor and cigarettes will rise. The Democrats want $1.8 billion in taxes over the next two years; Rell would raise taxes by $391 million. Williams is still hotly agitating for a tax on mini-millionaires. We’ve seen this punch and Judy show unfold in the same manner countless times. Republican Governors come and go; legislatures come and go. But the show never varies, and apparently people never tire of it. The audience leaves entertained, but poorer than they were when the curtain was rung up – because, shelving all the rhetoric, they will be paying for the show. The bottom line is this: The state is in dire financial straights, with none to pilot it out of danger. It needs a new script, and it will never get one from the old actors. Before she began to comment upon what is now called ObamaCare, Betsy McCaughey, a former lieutenant governor of New York and presently an adjunct senior fellow at the Hudson Institute, took the precaution of reading both the voluminous stimulus bill as well as the health care bill, a path not followed by the majority of legislators who either voted or are due to vote on both measures. McCaughey’s findings ought to disturb everyone who will be affected by either bill – which is to say, everyone in the United States. Her recent commentary in Bloomberg News begins: “Republican Senators are questioning whether President Barack Obama’s stimulus bill contains the right mix of tax breaks and cash infusions to jump-start the economy. That’s right: Health care provisions have been slipped past watchful eyes because they have been included not where one would expect them, in the health care bill, but in the stimulus package that, some Sherlock Holmes’ are beginning to discover, is costly to taxpayers while simulating little else but an insatiable legislative appetite for “free” dollars from Washington. U.S. Senators, yet to vote on the health care bill, should read the provisions in the stimulus package before voting on ObamaCare. Few will object a provision requiring a federal system to electronically track medical treatments, because such a provision will facilitate the sharing of medical records and avoid repetitive tests and errors associated with record duplication. But some provisions that enforce uniformity are reckless and harmful to health care as we know it. The obvious question – What penalties will deter your doctor from going beyond the electronically delivered protocols when your condition is atypical or you need an experimental treatment? – is left purposely vague. In his book, former Sen. Tom Daschle proposed an appointed body to decide “tough” questions politicians are loathed to answer. The stimulus bill follows his cue by establishing the Federal Coordinating Council for Comparative Effectiveness Research. The provisions in the stimulus bill respecting health care enforce rationed care according to a model common in Europe, where in 2006 the U.K. health board determined that elderly patients with macular degeneration must wait until they had gone blind in one eye before being eligible to receive a drug to save the other eye. Three years of energetic public protest reversed the decision – a picture perfect shot of the dangers involved when legislators do not sufficiently examine hidden pigs in hidden pokes. Has Connecticut Sen. Chris Dodd, now carrying the health care spear for an ailing Sen. Edward Kennedy, read these provisions in the stimulus bill? Have any of the members of Connecticut’s universally Democratic U.S. congressional delegation read these provisions? Obama maintains—with the support of the AARP—that overall, his changes in health-care are helpful to seniors and will save them thousands of dollars. Not so. Seniors are the big losers under ObamaCare according to Betsy McCaughey, the expert who has studied all the congressional plans. To make the cost deficit-neutral, which Obama declares is the goal, $500-$550 billion must be taken away from Medicare spending: less to nursing homes, drugs, protocols, to minimize the handicaps of disability. As a starter, the use of specialists should shift to primary-care doctors, on the misconception that the elderly overuse specialists. Betsy McCaughey reports that studies have shown that for heart patients, a shift to primary care results in a higher death rate. Primary-care physicians frequently misdiagnose heart patients, who are more often readmitted to the hospital. They die sooner. Dr. Emanuel, the brother of Rahm Emanuel, has written extensively in favor of abandoning efforts to help the elderly stay alive. Those with dementia, he urges, are no longer contributing to society. Let them go. One congressional bill provides that every five years, each elderly person shall meet with a government counselor to consider euthanasia. President Obama says the elderly may be denied surgery and given a pain-killer pill instead. The doctors on Obama’s council were chosen for their attitude toward treatment of the elderly. Patients faced with expensive needs for surgery will be judged by the planners on whether such an investment is “efficient” in view of the patient’s short future life. Peter Orszak, a member of the Administration team, has actually gone to Congress to ask them to remove such decision-making from the politicians to an independent group. If you like your health-care policy, you can keep it, repeats the President. Not so. Those with coverage will not be able to change it. Those who leave employer-provided coverage to work for themselves will not be able to buy individual coverage. This is to limit consumption and make sure everyone has the same health-care experience regardless of ability to pay. Equal Outcome. Senator Dr. Coburn submitted an amendment asking committee colleagues, will you buythe public option in place of your present insurance? For appearance’s sake, Dodd, Mikulski, Kennedy by proxy, voted yes. Everyone else voted NO. Senator Gregg, a Republican, said “Nobody should have to live under the public option.” Their present insurance is FEHBP, Federal Employees Health Benefits Program, choice among a grand assortment of 290 different private plans. The objective of these Senate and House bills is not to ensure that everybody is covered, but to ensure that everybody will have the same health-care experience regardless of their ability to pay. It doesn’t matter how rich you are if the government determines you cannot spend your money for superior health-care. Wealth won’t help the rich man if he cannot use it to buy what he needs. CBO’s head, Douglas Elmendorf, said last week government can’t “save” money on health-care by insuring everyone. The cost will be from $1 trillion to $1.6 trillion over ten years. This was bad news for the Administration, and he was “invited” to the White House for a meeting with President Obama and a phalanx of economic and health-care advisers. Perhaps intimidated, Elmendorf has since issued a supplementary statement saying that maybe $200 billion can be saved. A few facts: All cancer-survival rates, five years after diagnosis, are higher in the U.S. than in Europe, Great Britain, and Canada, for both men and women. Among women, the survival rate is 63% in the U.S., 56% in Europe, 53% in Great Britain and 58% in Canada; among men, 66% in the U.S., 47% in Europe, 45% in Great Britain and 53% in Canada. In Great Britain, which has had universal nationalized health-care for 50 years, the rates are below European average rates for both women (53%) and men (45%). The Canadian data for 2001-3 were compiled by economist June O’Neill, CBO head, and her economist husband. The other data were published by the National Center for Policy Analysis. The often cited “47 million” uninsured is overstated. Approximately a third are illegal immigrants, a third qualify for inclusion in a health-care program but are not enrolled; one-third can afford to buy insurance. There is a great deal that can be done to improve the present situation, but ObamaCare wants not reform, but revolution. While the objective during the campaign was to expand coverage, and recently to lower and control costs, the fundamental objective is to equalize consumption of health-care among rich and poor. In ObamaCare, regardless of income, it’s Equal Outcomes: Everyone (not elderly) should have equal health-care opportunities. The rich are not to consume a super drug which they can afford, if it is not also available and affordable to the poor. Redistribution of income is a prime goal in ObamaLand, and one way to redistribute income is to control how it is spent. Late news: Bills in both House (HR3200) and Senate transfer to President Obama from Congress all decisions over life and death of elderly and treatment of elderly. Dodd Untrustworthy, Is There A Blumenthal In His Future? A majority of Connecticut voters do not consider US Sen. Chris Dodd to be trustworthy, according to polls cited by Chris Cillizza of the Washington Post. Colin McEnroe reports, you decide. Michele Jacklin, former chief political writer for the Hartford Courant, is running for a spot on the Glastonbury Town Council. Michele Jacklin: I have lived in Glastonbury for 26 years with my husband, James Estrada. We have two children: Emily, a second-year law student at the University of Maryland, and Evan, a Peace Corps volunteer in Nicaragua. Both were educated in the Glastonbury public school system. For the past two years I have served as Director of Media Relations for Trinity College in Hartford. 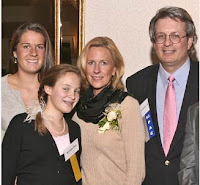 Prior to that, I managed the successful re-election campaign of state Sen. Ed Meyer of Guilford and was Policy Director for New Haven Mayor John DeStefano when he ran for governor in 2006. Most of my adult life, however, has been spent as a journalist, primarily with The Hartford Courant, where I was a town news reporter, legislative reporter, chief political reporter, editorial writer and political columnist. My chief concern in wanting to serve on the Town Council is to maintain Glastonbury's excellent quality of life, while ensuring the town's affordability so that people of all socioeconomic, racial and ethnic backgrounds can make their homes here. Is There A Schiff in Dodd’s Future? President Barack Obama’s approval rating continues to plummet after his address on health care, according to Rasmussen. “The President is now seen as politically liberal by 76%. That’s up six points from a month ago, 11 points since he was elected, and the highest total to date. Forty-eight percent (48%) now see him as Very Liberal, up 20 points since he was elected." It is always just a wee bit tricky to use the word “redemption” in connection with capital punishment, because redemption is a religious category. To be redeemed means to be saved. “We are all saved in the blood of the lamb.” This means that Christ’s sacrifice on the cross has saved us from our sins. Presumably those sins may include multiple murders. Catholics believe that sin demands expiation on the part of the sinner; penance is expiation. Protestants believe that good works are not useful in the redemptive scheme; we are redeemed by the grace of God alone. A couple of years ago, according to state prosecutors, two petty criminals, Steven Hayes and Joshua Komisarjevsky, both on parole at the time, broke into Dr., William Petit’s house, brutalized the doctor by beating him unconscious with a baseball bat, forced his wife to go to a bank and withdraw cash, raped his wife and daughter, tied his two daughters to a bed and set his house on fire. All the members of Dr. Petit’s family save Dr. Petit himself, who managed to escape from the house, perished in the flames. Hayes and Komisarjevsky were caught by police fleeing the area in Dr. Petit’s car. They were arrested, arraigned before a court, and are now in prison awaiting trial. The state has asked for the death penalty in their case. It is expected that four years of litigation may flow under the bridge before a verdict is rendered in the case. Appeals will follow. The last person executed in Connecticut for multiple murders was Michael Ross; it took a dozen years of litigation before he was executed, and one of the co-chairmen of Connecticut’s Judiciary Committee, Michael Lawlor, recently has stated that the death penalty cannot be executed in the state unless the convicted offender wants to die. How does redemption as a religious category figure in all this? Redemption, like most religious categories, has been imported into the secular realm and is sometimes confused with forgiveness. Hayes and Komisarjevsky are not likely to find redemption through the state. Neither is the state, now pursuing the death penalty in their case, likely to forgive them; that is to say, to let the two multiple murderers go or plead to a lesser punishment without suffering the penalty that is prescribed by law as appropriate for their crimes. The state may lose their case, but that is another question. Hayes and Komisarjevsky may receive forgiveness from the one remaining member of Dr. Petit’s family, the doctor himself, but this does not seems likely if Dr. Petit does not receive justice. And justice in the secular realm occurs when those who have broken the law receive from the state the penalty the state prescribes for breaking the law – in this case, the death penalty. So then, Hayes and Komisarjevsky may receive redemption from God, if they are believers, without the intervention of either Dr. Petit or the state; and neither of them is likely to be forgiven by either Dr. Petit or the state before their due punishment has been completed. On a purely human level – as represented by pre-Christian notions of redemption and expiation – the crimes that have been imputed to Hayes and Komisarjevsky have always required a just recompense before forgiveness is extended. Euripides despised pious frauds such as necromancers and soothsayers: having no belief in “blind fate,” he was not above impeaching the gods themselves as making men their playthings: “Arrest the god, whose word we must obey… his is the sin, not mine,” one of his characters says. The emptiness of self forgiveness in Euripides’ plays is filled with the luminous ideas of personal integrity and the reign of universal law. Crimes such as have been imputed to Hayes and Komisarjevsky must upset the quiet consciences of good men. When the state is not just towards the victims of crime, then should the quiet consciences of men cry out for an appeasing justice. The Rasmussen Reports daily Presidential Tracking Poll for Friday shows that 30% of the nation's voters now Strongly Approve of the way that Barack Obama is performing his role as President. Thirty-eight percent (38%) Strongly Disapprove giving Obama a Presidential Approval Index rating of -8 (see trends). Just 25% believe that the economic stimulus package has helped the economy. U.S. Sen. Chris Dodd’s advertising blitz hasn’t helped much. U.S. Sen. Joe Lieberman, who has not poured money into advertising and outreach efforts to salvage support within the Democratic Party after his slide in the polls, is even-steven: The poll shows Lieberman with an approval-disapproval rating of 46-46. Dodd’s rating is 42-52 percent. Dodd's slippage among independents, whose party affections are nil and whose ideology is eclectic, will be crucial in an election. Among independents, Dodd’s approval-disapproval rating is a near fatal 56–27 percent. President Barack Obama’s approval-disapproval rating has fallen below that of Gov. Jodi Rell in Connecticut. The president's ratings are down to 63 percent from 71 percent in May. The drop in support suggests Obama’s ideology is coming into focus with many voters. Dodd may now be considered a polarizing figure, while Lieberman's contours are still fungible, an irritant to the left wing of his party. Obama's silhouette has been sharpened by the liberal programs he supports. Ditto Dodd. Ramming through legislation without any assurance that it will work doesn’t seem pragmatic or farsighted. But for Obama’s purposes, it is. His goal is nothing short of an ideological reorientation of American government. Putting in place the structures to achieve this change in the power and role of government is more important than how precisely it is accomplished. The stimulus might not do much to stimulate the economy during the recession, but its massive spending creates a new baseline for all future spending. The cap-and-trade bill might not reduce carbon emissions during the next decade, but it creates a mechanism for exerting government control over a huge swath of the economy. Obamacare might not work as advertised, but it will tip more people into government care and create the predicate for rationing and price controls. Barack Obama is an ideologue in a hurry. He wants to put American government on a radically different path. And he wants to Do It Now. A new report by Secretary of State Susan Bysiewicz created a useful ripple in Connecticut’s political pond. According to a brief piece in the Connecticut Post, the report indicates that business failures for the first half of 2009 are up 17%. About 7,000 businesses have closed down. In-migration of new business is also down by 9.6%. The question is: Will these figures have any appreciable effect on Democratic plans to raise corporation taxes by 30% to meet a prospective deficit of $9 billion? The decrease in business activity in the state, the most important and portentous datum released this year by the Secretary of State’s office, should be regarded as a fatal arrow in the heel of Connecticut’s wounded economy. Mrs. Bysiewicz’s commentary piece, printed in the Danbury News Times. followed close on the heels of Gov. Jodi Rell’s veto of House Bill No. 6582, an Act Establishing the Connecticut Healthcare Partnership, and House Bill No. 6600, An Act Concerning the Establishment of the SustiNet Plan. In a couple of years, Connecticut will have an opportunity to test Mrs. Bysiewicz novel theory that the 17 percent increase in the state’s business closures and its 9.6% loss in new business is attributable chiefly to inadequate and costly insurance coverage, because the Democratic majority in the legislature, by overriding Mrs. Rell’s veto of SustiNet, has just now taken a major step in putting the state on a path towards universal health care. Programs similar to SustiNet in Massachusetts and Hawaii are seriously stressed because they have been found to be unusually expensive in a contracting market and have not proven to be the magical elixir promoted by Mrs. Bysiewicz in her eupeptic column. Confronting a massive budget shortfall, Massachusetts lawmakers are cutting from their Commonwealth Care program roughly 30 thousand legal immigrants. The cuts are expected to save $130 million a year. Boston Medical Center, one of the city’s largest metropolitan hospitals, has filed a lawsuit against the state. The medical center claims Massachusetts is shortchanging it by $181 million annually because the state is not adequately covering the costs of Medicaid, Commonwealth Care and the uninsured. Reimbursement rates on the poor have dropped to 64 cents on the dollar. Commonwealth Care was launched with much fanfare several years ago as a template for state and national universal health care systems. It is now – along with legal immigrants – hobbling towards an legislative emergency room. The override of Rell SustiNet veto by Democrats who dominate the state legislature will set up a panel to craft outlines for the SustiNet universal health care system; recommendations for implementation are due in January 2011, and the prospective system will take effect in 2012 – plenty of time for second and third thoughts. If Rell chooses to run on the Republican ticket for governor, Mrs. Bysiewicz will find herself campaigning against a seasoned politician who, perhaps with an eye on Massachusetts’ Commonwealth Care and Connecticut’s crushing $9 billion deficit, the highest per capita debt in the nation, has often enough said that in hard times imprudent spending must give way to hard but prudence decisions. The Connecticut Post is reporting that businesses in Connecticut are closing at a record pace: “Susan Bysiewicz says that in the first half of 2009, nearly 7,000 businesses shut down, a new record for the first half of any year since these figures were first recorded in 2000. “Bysiewicz says the figure represents a 17 percent increase in the number of business failures from the first two quarters of 2008. The match made in heaven between George David, the former CEO of United Technology, and Marie Douglas David, a Swedish countess, has been torn asunder. Their divorce hearing was being held in a Hartford court presided over by Judge Steven Frazzini and a pack of lawyers representing both parties. Several media outlets had been drawn to the scene of the dissolution for reasons having to do with money and dramaturgy. The persistent refrain of most news reports had been: How low have the mighty fallen. In more amicable days, the Davids together signed a post nuptial agreement limiting any post marital bloodletting to about $50 million, much of which was in stocks. Ms. David and her lawyer wanted about twice that much, and Mr. David understandably had been offering a stiff resistance to the demands, which he considered unreasonable. Having been married for seven years, the settlement for Ms. David represented a yearly salary of about $7,142,913, not a niggardly piece of the marital pie. The principle question to which the court should have addressed itself was: Does contract law mean anything at all in this the age of celebrity divorces? However, this question usually gets booted to the curb when one or both of the two marital parties are plunderable and the other is insatiable. In truth, the answer to the above legal question usually depends on the depth of one or the other of the celebrity’s pockets. Throughout the legal wrangling, Mr. David’s lawyers argued the contract was binding and more than generous. Ms. David’s lawyers thought the agreement had been voided when the two got together again after putting their “John Handcocks” to the document. The make up was brief and punctuated by marital infidelities on both sides; lawyers were dispatched hither and yon to dig up legal dirt, some of which was canned after what the gossip columnists likely considered a premature settlement. The $50 million David agreed to surrender to his wife upon the breakup of their marriage certainly had purchased a good deal of gold-plated legal representation. In her effort to force David to part with an additional $50 million, well beyond the amount stipulated in their less than iron-clad post nuptial agreement, Ms. David hired New York celebrity attorney William Beslow, who has been indispensable in helping such luminaries as Robert De Nero, Patricia Duff, Mia Farrow, Demi Moore, Tatum O’Neil and Harvey Keitel retain or lose money in domestic battles. On July 18, after much legal jousting, the two newly divorced millionaires appeared before reporters and announced their break-up had been finalized. Gossip columnists and editors who had for days been filling their front pages with news of the crack-up wept in their beers. Mr. David announced he was happy and dashed off to Martha’s Vineyard to participate in a race featuring his 90-foot ocean racer, Rambler, while the ex-Mrs. David, having accepted a few million beyond what had been specified in her post nuptial agreement, was looking forward to a summer free of Mr. David. According to one news report, “Besides the money — which started at $8 million, then adjusted to $6.5 million after Douglas-David forfeited $1.5 million owed to David for taxes he had paid on her behalf — she gets her two Mercedes-Benzes, including a $97,000 CLK320, her horse Chamaco, a chandelier from their Avon home and properties she already owned in Sweden. She must vacate the couple's $39 million Park Avenue co-op by Sept. 21.
Who says there are no happy cost efficient post marital endings? Mark Levin in his book, "Liberty and Tyranny, A Conservative Manifesto," demonstrates the tyranny of Statists by their positions on current issues. According to Levin on his radio show, he wrote 98 percent of the book before Barack Obama became President. Obama’s name appears only twice, but his positions are apparent on many of the issues discussed. How does the Statist operate? He attacks the Founding Fathers as slaveholders, and he favors revolutions because they cleanse “society of religious dogma, antiquated traditions, backward customs, and ambitious individuals who differ with or obstruct the Statist’s plans.” He favors the progressive income tax (Marx would endorse, Adam Smith would oppose). He creates more agencies (Retrofit for Energy and Environmental Performance is in the Cap-and-Trade bill, Consumer Financial Project Safety Commission surfaced last week). Levin shows how the housing subprime fiasco came about in which “the Federal Reserve Board’s [hurtful] role cannot be overstated.” It provided bailout funds to financial institutions and then acquired equity in private corporations. (pp.68-71; there is no index). Hoover, amidst rising unemployment, raised the income tax from 24% to 63%, and FDR raised the top rate from 79% to 90%. Industrial production fell 25% in the six months after Roosevelt introduced the NIRA (National Industrial Recovery Act), which forced companies into cartels and set up a government bureaucracy of two million firms and 22 million employees to control the economy. Treaties that do not improve and preserve civil society, Levin says, are useful to lock in the Administration’s position. Subjects like weakness on foreign policy (Law of the Sea Treaty hasn’t yet come up), national security (civil rights used to weaken it); criminalizing war, global citizenship. START I expires on December 5, 2009. President Obama has returned from Russia with a new treaty. He says he will preserve some START provisions by Executive Order if the Senate has not acted upon them, which may be unconstitutional. We constitute a fifth of the world’s population but use most of the world’s resources, so we are expected to shrink our economy, according to the Statist-global governance and Socialist International’s Commission for a Sustainable World Society. A pending fiscal disaster is cost of entitlements Social Security, Medicare, and Medicaid. Medicaid subsidizes low-income, pregnant, and disabled people—one fourth of the population. The Congressional Budget Office estimates that, if nothing is done to stop the inclining trend, those who now pay 10% in income tax will, by 2082, pay 25%; those who pay 25% will pay 63%; the highest bracket now paying 35% will pay 88%. Social Security was started by Roosevelt. These days, the government regularly sends the individual “the false impression that his payroll taxes have been set aside for his use upon retirement.” We have been deceived by the Statist to believe that the government has been prudent in managing his accumulated pension investment in Social Security. There is no “Social Security trust fund.” So virtuous is its purpose that no one dares betray the fraud. Economist-journalist Martha Derthick wrote about it and Medicare and Medicaid 25 years ago: “Economic analysts who exposed . . . the myth of social security learned to expect a swift and vigorous response from program executives especially if critics were liberals”—heretics endangering the system. Social Security is not a program, it is a religion observes Levin. Social Security, Medicare, and Medicaid are built on a family of frauds—the fraudulent concealment of material facts, the fraudulent representation of material facts, and the fraudulent conversion of one’s money for another’s use. . . .
What should conservatives do? See Levin’s Epilogue. Where is the US nightly television (broadcast and cable) coverage of our service people returning in coffins? Where are the brutal and honest images of Afghanistan--of Afghan women and children killed, of US soldiers in the hell of combat. Where is the coverage of the staggering increase of post-traumatic stress disorder, depression, traumatic brain injuries and suicides among the many 1000s of service members who've already paid a price for Iraq and Afghanistan? Have the networks and cable channels spent so much of their budgets covering Michael Jackson's untimely death and star-studded memorial, Sarah Palin's ramblings and Mark Sanford's personal and political derelictions that they can't give us the real news we need if we're to be a democracy informed about what our country is doing in our name? Top Secret Budgets: Crisis, What Crisis? Every time politicians gather together in secret sessions, journalists the world over feel a floppy emptiness in the pit of their stomachs, perhaps because they realize the justice of George Bernard Shaw’s remark: Every profession is a conspiracy against the laity. Professional politicians are the conspirators; journalists, on the other hand, like to think of themselves as representatives of the laity. This rule – that the public business must be conducted in the naked public square, where the tribunes of the people can keep a watchful eye on the conspirators and report back to the laity– is generally waved in around budget time. Here in Connecticut, final budgets are hammered out not in open sessions but in formerly smoke filled rooms where politicians practice their profession, the second oldest profession. This year, as in most years, Republicans, Democrats and the reigning governor have not been able to fashion a budget while under close scrutiny by the fourth estate. There are many reasons for this, principle among them that politicians, fearful of an excess of light, like to work after hours in the dark. Michele Jacklin, once the chief political reporter for the Hartford Courant, Connecticut’s only state-wide newspaper, who left the ink-stained wretch business to work on John DeStefano’s fruitless campaign for governor, returned to her old haunt some time ago and suggested – nay, demanded – that Gov. Jodi Rell, who claims to want to put the lid on spending, and free falling, free spending Democrats in the legislature should be put together in some formerly smoke filled room, far from the madding crowd of journalists who dog their every step, so that the warring parties may hammer out a budget acceptable to the conspirators. No one blinked an eye at the suggestion. And that is what is now coming to pass. The conspirators this year have assembled at the governor’s mansion; the doors have been locked and barred; pizza has been ordered. A monstrous combination, a cross between donkey and an elephant, will emerge at the end of these sessions. Of course, no one will like the product, no one -- not the assembled Democratic leaders, not the Republicans in the room, not Governor Jodi Rell, not the tribunes of the people, not the taxed to death laity, not even Michele Jacklin. Everyone will be shatteringly displeased. The last time in Connecticut the legislature and governor gathered together to discharge multi-billion dollar deficit, the laity was whacked with an income tax. Everyone frowned for a full month. This ancient show, this grand posturing, is beginning to wear thin, which is why tea parties and other mini-revolts are springing up everywhere in the state. The tea parties are small crucibles of people who have had enough of taxes and just aren’t going to take it any more. Connecticut, last in job growth for the past decade, is a magnet for discontent. While California’s deficit is higher, $26 billion to Connecticut’s puny $8 billion, the nutmeg state is number one in per capita debt. California’s debt will cost every person in that state around $712, New York about $918. The comparable figure in Connecticut is a crushing $2,513, according to the Institute of Economic Research in Great Barrington, Massachusetts, known for many years here in the Job Bleeding State as Taxachussetts. Expropriating taxes from plundered quarter-millionaires, a vanishing species, the application of the usual bromides, and Band-Aid solutions ain’t gonna patch together this shattered Humpty Dumpty. The name Neda, here in the United States and in the world, has become pretty much a synonym for the Iranian resistance, now in a pause mode. Neda Agha-Soltan was the beautiful young Iranian, not yet wrapped in a burka, shot by a sharpshooter in Iran, whose gruesome death was caught in a brief video seen by millions, including the president of the United States, Barack Obama. It would have been a grand idea had Obama reached for his Kierkegaard before using the words “bearing witness” and “truth” in the same sentence. When those words were used by a eulogist in connection with a Danish bishop who had just died, Kierkegaard exploded in indignation, because he knew witnessing to the truth was a Christian category that pointed directly to the cross. Peter, crucified upside down because he felt he was not worthy to die upright in the manner of Jesus, was a witness to the truth. The bishop, whose witness consisted entirely in words – pretty and, at least in connection with Christian witnessing, entirely false -- was not. Paul, who suffered martyrdom, was a witness to the truth. The bishop, whose rhetorical witness, uncrowned with the wreath of suffering, paled in comparison with that of the early Christians, was not. Neda, an innocent victim whose blood was poured out, was a witness to the truth; Martin Luther King was a witness to the truth. Witnessing can never be a passive act, particularly when one is witnessing injustice. Surely, that is what Martin Luther King meant when he said the arc of the moral universe bends towards justice. One bends towards justice because witnessing injustice demands a response that is clear, unambiguous and virtuous. Words, in these circumstances, are valuable as a prelude to action. But if they do not lead to corrective action, they are worse than useless. One does not bend towards justice by impassively delivering pretty speeches from one’s easy chair. To bend towards justice is to honor justice through virtuous action. Originally, the word “virtue” pointed to moral strength, manliness, valor and worth, from the Latin root “vir,” which meant “man.” The phrase “by virtue of” preserves the word’s medieval sense of “efficacy.” It is right action that bends the moral universe into a bow. Nothing could be plainer than the truth: the withering away of jihadism in the Middle East is in the interest not only of the United States but of the Islamic and Non-Islamic world. That is a truth to which Obama has closed his eyes, because if the truth struck him with the force of a thunderbolt, he would be spurred to action – and action involves hard choices. According to a story in the Hartford Courant, the state’s US House delegation, all Democrats, voted in favor of climate change legislation that will increase the average American family’s yearly expenses by $1,500. The federal congressional budget office and the US Environmental Protection Agency estimate the yearly rise at $80 - $175 per year. Let's put it this way: All regulations involve hidden costs passed along to consumers in the form of price increases. In this way regulatory costs are like business taxes, and business taxes passed along to consumers are destimulants. What the government gives with the right hand it takes away with the left, leaving taxpayers, to quote an old saw, "holding the bag." Last week it was reported, incorrectly as it happened, that President Barack Obama wished to pass through the US Congress a bill reversing the rotation of the earth on its axis because it had been brought to his attention, by Speaker of the House Nancy Pelosi some thought, that water in the toilet bowel revolves when flushed in a counter clockwise direction. “This is intolerable,” the president reportedly said. Colin Powell worries that President Barack Obama is trying to tackle too many big issues at one time and he offers this advice: take a hard look at costs and consider the additional red tape that will be created. "The right answer is, 'Give me a government that works,'" the former secretary of state said in a television interview to be aired Sunday. "Keep it as small as possible," added Powell, who said he has spoken recently with Obama and stays in touch with him. Powell, a Republican, endorsed Obama last year over the GOP presidential nominee, Arizona Sen. John McCain. Obama wants to overhaul the health care system and take on climate change while also helping the country emerge from the recession. "I think one of the cautions that has to be given to the president - and I've talked to some of his people about this - is that you can't have so many things on the table that you can't absorb it all. And we can't pay for it all," Powell said. "And I never would have believed that we would have budgets that are running into the multi-trillions of dollars, and we are amassing a huge, huge national debt that, if we don't pay for in our lifetime, our kids and grandkids and great grandchildren will have to pay for it." Advisors surrounding the president deflected Powell’s criticism. Hell hath no fury like a media commentator whose narrative has been scorned. This is the way things were supposed to go: Governor of Alaska Sarah Palin would abide the pelting of a pitiless storm of law suits filed by her political opponents in Alaska, all of which have been turned aside by the courts; then she was supposed to run either for president or for some other national office, at which point the pelting would begin all over again. As the Fourth of July approached, Palin announced that she was retiring as Governor of Alaska, and shortly thereafter the speculation hit the fan. Vain speculators on the left, a good many of whom apparently read Vanity Fair, thought that Palin resigned because she could not bear the heat pouring out of the political kitchen. The Vanity Fair article, ten thousand words long, drew the veil off some of the infighting that occurred in the John McCain political camp after McCain picked Palin to run as his vice presidential candidate, on the whole not a pretty picture. With the exception of a few new snark bites, there is nothing fresh in Todd Purdum's piece, much of it being warmed over vitriol. Maureen Dowd, the New York Time’s Queen of scorn, is far better at the catty putdown than Purdum. A sampling of Dowd’s toxic bon bons: "Exquisite battiness... solipsistic meltdown so strange... incoherent, breathless and prickly... Sarah's country-music melodramas... girlish burbling." Since the ascension of President Barack Obama, the left has found it inconvenient to write on national political issues. Most of the chatter on television was devoted to two questions: Why had she done it, and is there political life after resignation? Running like a dark rumor through the chatter was the supposition that some unspeakable political faux pas had yet to be uncovered. The answer to the second question was “probably not.” Some wiser heads with memories pointed out that other politicians had salvaged their careers after greater tragedies. In deference to Massachusetts Sen. Ted Kennedy, now suffering from a brain tumor, Chappaquiddick was not mentioned. In deference to Obama, the tax delinquencies of his Treasury Secretary remained in the commentary closet. As yet, there is no federal investigation of Sen. Chris Dodd's property in Ireland. The vindictive prosecution of Alaska Sen. Ted Stevens is a distant memory. Last April, federal judge Emmet Sullivan formally accepted a motion to set aside a guilty verdict against former Sen.Ted Stevens of Alaska issued by President Barack Obama’s Attorney General. The presiding judge threw out the indictment, and called the case the worst case of prosecutorial misconduct he'd ever seen. The judge also initiated a criminal contempt investigation of six members of the prosecution even though an internal probe by the Office of Professional Responsibility was in process. Sullivan said he was not willing to trust it due to the "shocking and disturbing" nature of the misconduct. Palin herself suggested 1) that her family had been unjustly pummeled before and after the campaign, both by vain politicians and consumers of Vanity Fair; 2) that she was spending an inordinate amount of money defending herself from unmerited prosecutions; 3) that she cared about Alaska’s future, and that resigning now would enable the Lieutenant Governor of that state to carry on after she had left and most likely win a future campaign in his own right, thus keeping her beloved state in Republican hands. She was resigning, Palin said, “ … so the administration could continue effectively” without her. Self sacrifice of this kind is unheard of in national politics. Palin also intimated she would be willing to go on the road to support the candidacy of grown up politicians in either party. Point 1 was studiously ignored by the Vanity Fair crowd; everyone but some small minded bloggers on the left conceded point 2; and point 3 was opaque to the kind of political beltway commentator who believes that politics ends at the borders of Washington DC. Anyone who had spent any time commenting on state politics would have had no problem processing point 3. So, here we have a politician who cares about her family, cares about her reputation, cares about her state, thinks some ideas are bogus while others are worth sacrificing for, and wanted to avoid the perils of federal politically inspired prosecutions. How could there possibly be a place for her in Washington politics? Citing a source close to the principals, the Washington Times is reporting that “Secretary of State Hillary Rodham Clinton urged President Obama for two days to toughen his language on Iran before he did so, and then was surprised when he condemned Iran's crackdown on demonstrators last week, administration officials say. “On the one hand, he may have felt that the United States should naturally criticize the Iranian government's violent crackdown on the protesters," said Alireza Nader, an analyst at the Rand Corp. "On the other, he acknowledged that the U.S. was still willing to engage with Iran in the future. Strong U.S. criticism of the Iranian government could jeopardize future negotiations." Mrs. Clinton agreed with the president, but she thought it was time to get tougher after the June 20 killing of a young woman, Neda Agha-Soltan, on a Tehran street, officials said. A video of the killing was widely viewed on the Internet. At the same time, they added, she was content to leave the decision to Mr. Obama, because she understood that he bore ultimate responsibility for any consequences. California governor Arnold Schwarzenegger is passing around IOUs. Well after President Barack Obama’s one hundredth day in office, the nation’s unemployment rate has climbed to 9.%. Governor Jodi Rell said “No” to Connecticut’s suicidal Democrats. It's a pretty safe bet that no one either in California or Connecticut will be "living the life of Reilly" any time soon, the subject of this month's word for the day. Connecticut Attorney General Richard Blumenthal thinks that Connecticut’s Ethics Committee attack on the Catholic Church may be unconstitutional. In East Hartford Connecticut on Tuesday, 35-year-old William Castillo succumbed to bullets. The next day on Wednesday, his friends gathered together at a candlelight vigil, and a quarrel over a dog broke out among the mourners. Three people were shot, one fatally. The good news is that police have determined that the second shooting was not in retaliation for the first. At one point in his career as a fiscal conservative transforming into a tax and spend liberal, Jim Amann, the then the Speaker of the House now running for governor, speculated that Gov. Jodi Rell’s popularity was unsinkable because the public viewed her as everyone’s grandma. When the “grandma” body-slam failed in its effect, Amann, and other Democrats, took to calling Rell ‘Snow White,’ which was even less productive. People who know Snow White, an evocation of Eve in the garden, like her because she is snowy and white and not at all like the queen disguised as a farmer’s wife who tempts her fatally with that poisonous but tasty apple. Amann intended his remarks as withering criticism. The intimation was that in matters of economics, an arcane and highly manipulable science, Rell was somewhat dimwitted when compared to, say, the economic propaganda minister of the Democratic Party, the academic or party functionary with a degree in Early Marx we see regularly on our TV sets waving in our faces the latest “study” showing that Connecticut, relative to other states, is actually under taxed. Not for nothing did Disraeli say that there were three kinds of lies: Lies, damned lies, and statistics. Amann’s ham fisted attack didn’t work, and it is worth considering why. Our grandmother’s view of economics is certainly more homespun and far less self interested than the propaganda minister’s. This sound advice does not accommodate the tax and spend proclivities of many leading Democrats. Grandma will always and ever be a great disappointment to them. But we know, almost instinctively, that grandma is on to something. And we also know that advice good for the goose is also good for the gander. Municipalities and states would be well advised in hard times to save money. And during lean times, The state would be well advised to stop spending money and cut up its credit card. Bonding in Connecticut is the equivalent of a state credit card. It is not academic stuffed shirts or statistical reports written by Disraeli’s “liars” or bewitching tales told by propaganda ministers – take a bite of this pretty apple please -- that have driven these lessons home to us. It is the lashes on our back as we move through the world that has taught us the truth. Rell also has had her problem with Republicans, who now are in a fighting mood. Republicans generally are perfectly willing to accommodate themselves to their own Grandma’s superior wisdom. However, having been bitten in the past by other faux Republicans and faux conservative Republicans -- former Gov. Lowell Weicker, who gave us the income tax, violating an implicit promise he would do no such thing, and former Gov. John Rowland, who wrested the office from Weicker’s designated gubernatorial hitter, Eunice Groark, on a promise he would devote his efforts to repealing the income tax – stalwart Republicans are just a little leery of campaign feints and dodges, not to mention the compromises past Republican governors have made to accommodate unyielding legislative leaders. Lately, Rell has sounded grandmotherly -- in the good sense – in her opposition. She has not hesitated to call Democrat budget makers out on their failure to present a timely budget. Democrats slammed the governor for short-sheeting the bottom line on her own budget, but this was no bar for them in presenting their own, which they steadfastly declined to do. When Democrats finally did present a budget, days before the fiscal year was to end, it was all thorn and no rose, a laughable piece of legislation that will send remaining Connecticut businesses scurrying to other states. The two parties, Rell and the Democratic mob of legislative leaders, have now entered private negotiations. Common wisdom has it that, having put away their rhetoric, all will emerge from the secret confab with a rescue plan acceptable to all. That plan, most political watchers imagine, will be something on the order of a fifty-fifty split: a fifty percent raise in taxes and a fifty percent cut in spending to accommodate a more than $8 billion deficit. Rell, when last heard from, wanted a plan that would position the state favorably with respect to other states. She should stick with her grandmotherly perceptions.